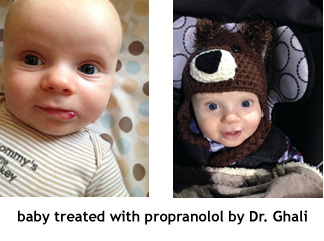 Preop hemangioma of ear; no response to oral propranolol; (b) Two week postoperative result, awaiting additional laser therapy to residual skin. Photos by Dr. Gregory Levitin. 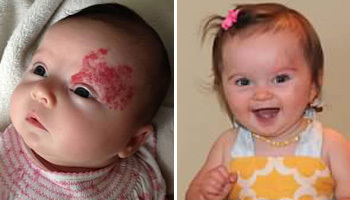 Hemangioma at 10 weeks and at one year, after treatment with propranolol. 12 month old with left upper eyelid hemangioma with visual obstruction; (b) 6 weeks postop one surgery (c) 6 months postop after additional laser therapy. Photos provided by Dr. Gregory Levitin. 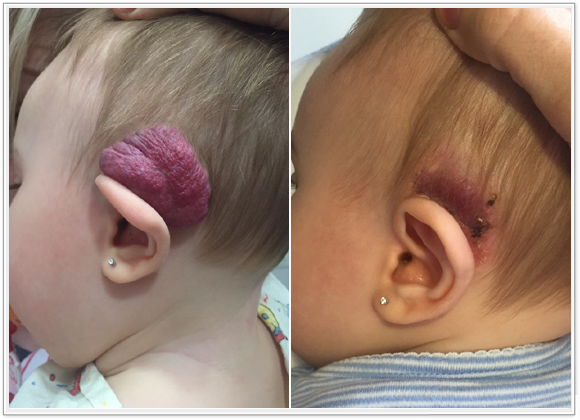 12-month-old with extensive segmental hemangioma with ulcerations; (b) 1 year follow up after 2-stage reconstruction with left eye open and functional; removal of ulceration/scars of the scalp and reconstruction of nose. Photos by Dr. Gregory Levitin. 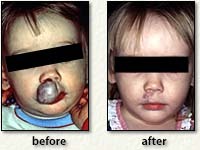 2 1/2- year- old child with an extensive hemangioma of her upper lip before and after surgical resection. She still requires further surgery but has shown considerable improvement. 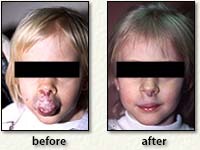 A child with an extensive hemangioma of her upper lip before and after surgical resection. 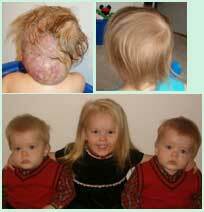 She still has some residual hemangioma in her skin but this can easily be treated with a pulsed dye laser. 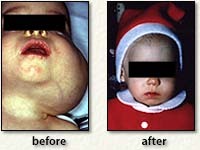 A child with an extensive hemangioma and considerable scarring of the upper lip. 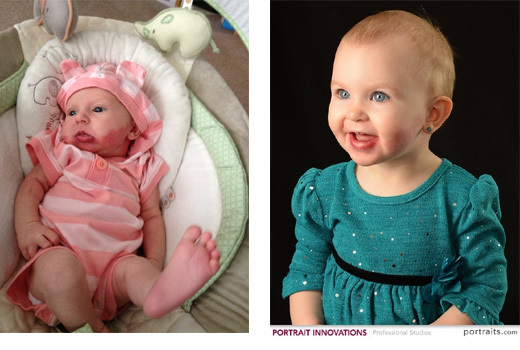 The after photo shows the child after extensive surgery and skin resurfacing as well as pulsed dye laser treatments. 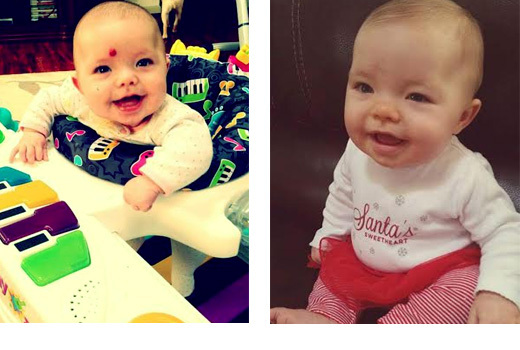 A child with an extensive parotid hemangioma before and after resection. The child is shown just 3-4 weeks after resection. 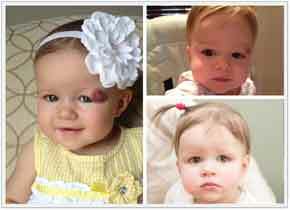 A child with an occipital hemangioma before and after surgical excision. 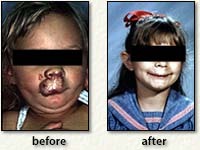 A child with an extensive lower lip hemangioma before and after surgical resection. 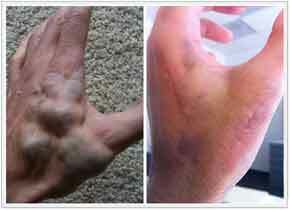 Venous malformation of the hand causing pain and limitation to range of motion; (b) 3 months after 2 stage surgical excision. Photos by Dr. Gregory Levitin. Photos are courtesy Milton Waner, M.D. 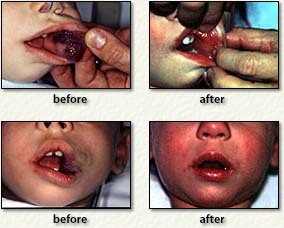 A child with an extensive venous malformation of the upper lip and corner of the mouth. Before and after laser treatment and surgical resection are shown. 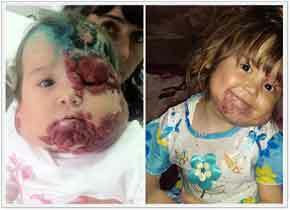 A child with an extensive venous malformation of the corner of her mouth as well as the buccal fat space. The lesion was treated with laser and then followed with surgical resection. The child is seen here with the end of the first resection just prior to the final correction to the corner of her mouth. 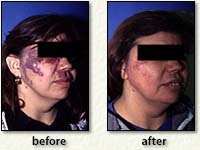 A patient with an extensive portwine stain of her cheek and upper lip before and after laser treatment with a copper vapor laser as well as a pulsed dye laser. 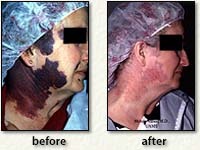 A patient with an extensive portwine stain before and after treatment with a pulsed dye laser. 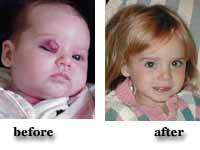 Hana before and after surgery performed by Dr. Waner.